Since its establishment, Sony has sought to remain at the forefront of technological development, building continuously on its achievements to suggest new values for people everywhere. In these efforts, Sony recognizes the people who work at Sony to be its most important resource. Employees are important stakeholders in Sony’s diversified, global business and are the key to its efforts to generate sustainable social value and a high level of profit. Sony is committed to increasing employee engagement by leveraging the diversity and ambitions of its people and maximizing their talents. Sony seeks to sustainably elevate its talent and organizational capabilities in order to raise its overall business performance. Sony’s Founding Prospectus sets forth the company’s founding vision and basic commitment to its employees, stressing a spirit of freedom and open-mindedness with an emphasis on personal ability and performance, the full exercise of individual abilities and skills, and innovation and challenge. Based on the founding vision, Sony has articulated its Employer Value Proposition (EVP), which defines the current value of working at Sony, what sets it apart as a place to work. The EVP includes the overarching “wow” factor of “Together, Let’s Make the World Say Wow,” and other wow factors that define the value that Sony offers to its employees and what it expects from them, both across the Sony Group and specific to its businesses and regions. 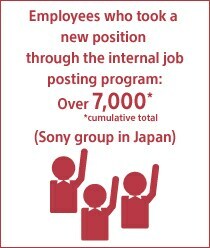 Sony seeks to maximize the talents of each employee and to foster innovation. Sony respects and fosters an inclusive acceptance of diversity in its many forms including race, ethnicity, nationality, religion, beliefs, disability, gender, age, birthplace, sexual orientation, values, and workstyles. Sony’s vision of diversity and inclusion seeks to build an organizational culture that respects diversity and helps create value for customers. Sony pursues a broad range of activities with a focus on diversity & inclusion, talent development, and engagement, building on a commitment to offering working conditions that contribute to the health and safety of employees. Senior management meet to discuss and decide upon important matters relating to employees at the Sony Group and guide the HR strategies implemented by Sony Group companies. Sony has established the Diversity Committee, which reports directly to the CEO, to ensure that diversity & inclusion is addressed as a high-priority issue. Sony also operates reporting hotlines and other avenues for employees to get consultation on a broad range of issues including human rights, work-life balance, parenting, nursing care, and LGBT concerns. Sony promotes occupational health and safety (OHS) by operating management systems based on OHSAS 18001 at all Sony sites worldwide. With the publication of the ISO 45001 international standard for OHS management systems in March 2018, Sony plans to migrate its OHS management systems to ISO 45001. With a focus on diversity, talent development, and engagement, Sony will continue to offer working conditions that contribute to the health and safety of employees — all part of its efforts to generate sustainable social value and a high level of profit. Sony will provide opportunities for employees to improve and make the most of their character, skills and capabilities.